Oceanview home w/ a private hot tub & two decks, 200 feet from beach access! With three levels and amazing ocean views, this beachfront home is the perfect escape from the everyday! Soak in the master bath tub or savor a glass of wine on one of two decks. 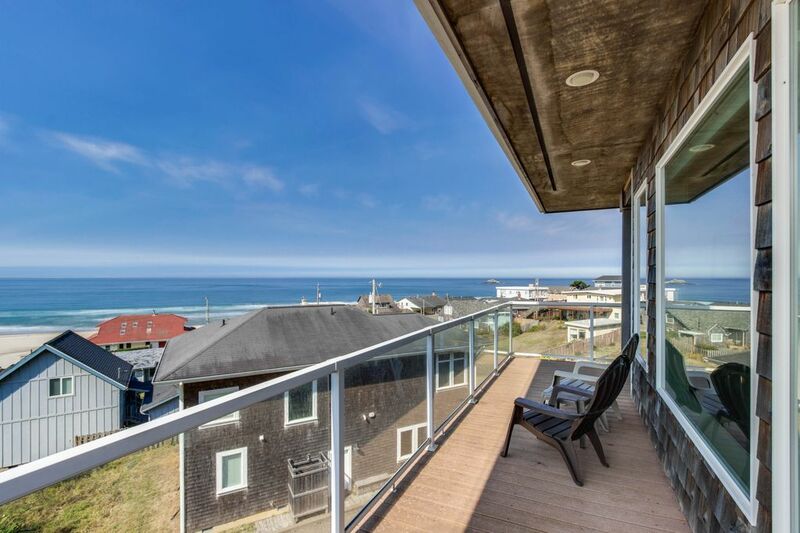 It's luxury at its finest at this Lincoln City rental. Just one mile from downtown Lincoln City and only a block from the water's edge, families will especially find this home intriguing. Park up to four cars here and walk or bike! There's an upper level, a large kitchen, and an air hockey table for those rainy nights in. Enter the upper level and you'll find the expansive great room complete with two large plush couches, two red chairs and a flatscreen cable TV. A gas fireplace is on hand to warm up those cold tootsies after a cold day beach combing, while a wraparound deck affords amazing views of the environs. The kitchen and dining area are large and inviting with a table for six, a dishwasher, and enough cupboard and counter space to make any gourmand drool with envy. A bedroom and den with a queen bed and antiques lies just down the hall and both have gorgeous views of the Pacific. The second level boasts two additional expansive bedrooms as well as a master suite. The master features a king bed as well as an ensuite bath with dual sinks and a garden tub with lovely views. A separate shower and commode provides plenty of privacy. The other bedrooms feature queen brass beds and lovely artwork, and just down the hallway, you'll find another half bath. Two sofabeds will sleep any remaining guests. The main floor features a mudroom, making it an ideal place to toss those muddy shoes or sand-filled clothing. A laundry room is also on hand with a washer and dryer and you'll have free WiFi. Up to 12 guests (eight adults) will feel right at home here. Lincoln City boasts a plethora of restaurants and boutiques to while away the hours. There's plenty of places to hike, bike, or savor a lovely sunset on the ocean. Treat your family to a lovely getaway at this gorgeous three-story home in Lincoln City. There is a strict maximum of 4 cars allowed at this property. Additional vehicles may be towed at the owner's sole expense. (b) With respect to allowed cars, all vehicles must be parked within designated parking spaces on the vacation rental property. No parked is allowed within public parking spaces whatsoever. (c) All vehicles parked outside of Lincoln City parking regulations are subject to towing at the vehicle owner's sole expense. You understand and acknowledge that your breach of these parking restrictions may result in Lincoln City terminating the permit allowing for short term rentals at the Home. As such, you acknowledge that it is important for all guests and visitors to abide by these parking restrictions. Guest Entry Instructions: This rental utilizes an E-lock, a digital lock that requires an unique code to enter. This code is reset after each guest's stay. Thanks for considering a Vacasa home! We provide full-service management for privately owned vacation homes, and like to think that we offer our guests the best of both worlds: the unique experience of staying in a one-of-a-kind vacation home, with the peace of mind that comes from knowing that the home you book for your special vacation is cared for by professional housekeepers and property managers. <br> <br> Vacasa began in 2009, simply because our founder and CEO Eric wanted to find a better way to share his wife’s family’s summer home in Long Beach, Washington with guests as a vacation rental. Eric and his early team worked to build Vacasa on the premise that local employees can do what they love most (taking care of guests, homeowners, and properties), while the hands-off tasks of vacation rental management—things like marketing, filing taxes, and maintaining a website—could be handled by a specialized central support team. <br> <br> Our passion is connecting travelers with the unique experience of staying in a vacation home, and we would be honored to be your host. Please contact us with any questions about this home—our team is standing by! This house was absolutely beautiful. Well stocked, beach access right across the street and beautiful views from the top deck. We didn't want to come home. Loved staying here. It had a great view of the ocean. Was peaceful. Clean house with lots of games and well supplied kitchen. Good layout over 3 floors. Kitchen and living area are excellent. Hot tub was small but who can complain about a hot tub. Overall excellent. Nice home! Clean, well-stocked, and everything in good working condition. Beach access super close. An excellent choice in iffy weather as you can stay in and watch the waves from the comfort of the living room. Road's End is a sweet area, though note the homes are a tight-in together, and you will see fellow beach lovers from open windows and patios. Loved it but parking is a bit tight! Will like to spend the night again at this place! Major Credit Cards Accepted. Taxes and fees are not included. Rates and availability calendars may change until time of booking.